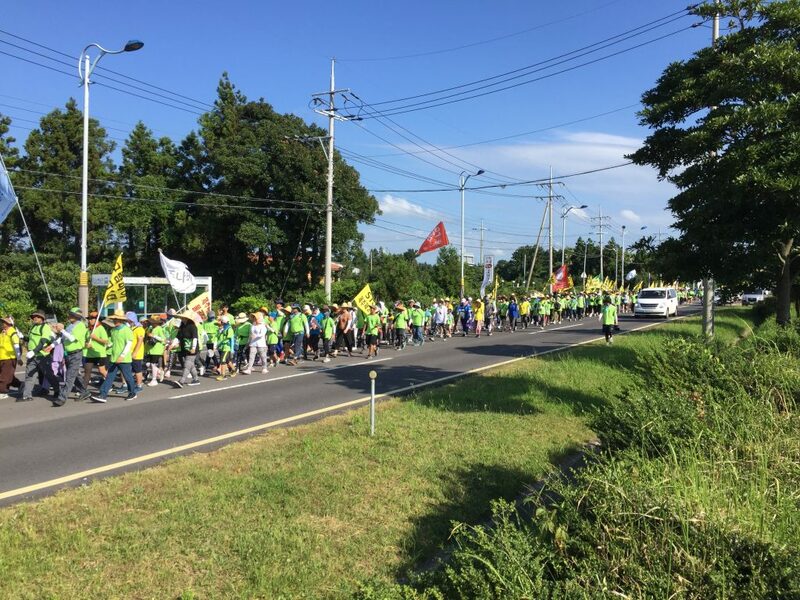 Jeju-Do, South Korea—On the cusp of July and August, nearly 200 students and 150 adults participated in a three-day march in opposition to the construction of a second airport on Jeju-Do, South Korea. The government’s plans include leveling two small mountains on the eastern side of the island and the likely relocation of an elementary school. If built, the airport will increase an implanted trend of hyper-tourism, which puts heavy stress on local groundwater resources and displaces farmers. Students and supporters march in opposition to a proposed airport on Jeju-Do, South Korea. Photo: Buddy Bell for News & Letters. Jeju activists fought an 11-year struggle against the construction of a new naval base that the Seoul government claimed was to become a civilian dock, so they believe the new airport will also have a military character despite official denials. The activists invited members of the community and students from primary and secondary schools in Seogwipo, Pyoseon, and Seongsan to walk 20 kilometers a day in summer heat, starting from the new naval base in Gangjeong and heading for the airport site in Seongsan. A hearty logistical team worked to serve hundreds of breakfasts, lunches, and dinners. At night, marchers went home or slept in school gymnasiums after evening events, including choreographed dances to popular music. When the march concluded, many active community members remained at a Seongsan gymnasium for a two-day conference on Jeju’s current challenges. A nuclear submarine from the U.S. recently docked at Gangjeong, endangering villagers—and the sea life on which many of them depend—with radiation. What’s more, that ship is likely not the last, as the Moon government plans to host a naval parade off the coast of Jeju from Oct 10-14, with 70 countries participating. Conferees heard from a Yemeni woman who did not reveal her identity because the acceptance of 500 Yemeni refugees in Jeju (not mainland Korea) by the government in Seoul has caused stereotype and nativism to pervade the island. Earlier this year, Jeju activists opened a peace center specifically to bring Korean and Yemeni people together, to converse and learn from one another. This entry was posted in Articles and tagged Buddy Bell, displaced Yemenis, Gangjeong, Jeju-Do, Moon Jae-in, Pyoseon, Seogwipo, Seongsan, Seoul, South Korea. Bookmark the permalink.